Models based on Sutrue’s Formlabs prints are preparing to make an entrance in an unexpected setting: the operating room. Sutrue, a startup medical device company created by Alex Berry and his colleagues, has designed and created an automated surgical suturing device and is currently working on creating an endoscopic version. Alex Berry’s training in architectural design sparked his interest in CAD programs, which inspired him to create his own automated suturing device. Along with others who shared his vision, he designed some early prototypes of a suturing device, using layers of laser-cut mylar and aluminum. Four years ago they started using high-resolution 3D printed parts to assemble their products, before launching Sutrue in 2012. They completed their first successful design in 2013 with the help of funding from the National Innovation Centre in the United Kingdom. To learn more about how Sutrue uses Formlabs 3D printers to develop their products, we asked Berry to walk us through Sutrue’s desktop 3D printing process. Formlabs: What have you been printing on your Formlabs 3D printer? Alex Berry: Everything! We have printed the obligatory rook piece, but mainly parts for our new endoscopic suturing device. We have also been printing some cross sections of the prototype, which we could never have done before as the cost was too high given most 3D print companies have a minimum charge. We have also been experimenting with some parts for beating heart surgery with the Royal Brompton Hospital. At the moment there are a few regulatory hurdles to overcome, and there are many stages before patient trials, but we can definitely see a use for stereolithography 3D printers in custom surgical devices. In the meantime we have printed a model of a coronary artery and a casing for a diagnostic device for the Hospital we work with, The Royal Brompton Hospital in London. They have a new chair that is used to measure quadricep muscle strength in order to show the effectiveness of treatment for certain degenerative diseases. The Clinical Engineering department didn't have the budget to get a one-off mold made for the casing, so they asked us to design and print one for them. It's made from several sections that we are going to bond together with resin and a laser pointer as the whole unit is 215mm x 120mm x 75mm. There is a touchscreen that fits in the gap and we are going to fill in the text section with possibly grey resin. F: What types of medical cases could your suturing device be used for? How is it different from other products on the market? AB: We believe the device could be used for all medical procedures that include suturing depending on the different device sizes. We think the larger hand-held head would be well suited to wound closure and any external work. We think that the smaller hand-held version for delicate and internal work and the endoscopic version for any appropriate remote suturing, including robotics. We are just getting a new set of all 3 devices assembled for our next set of basic trials and hope to move on to tissue trials in the next few months. The Sutrue device is powered from a motor in a handle (apart from the endoscopic version which can also be attached directly to a robotic arm). The drive is transferred through a gear mechanism to pairs of driven rollers that work together to grip a needle and rotate it. The handle has a forwards and backwards button, the user presses the forward button once, the needle sets itself in a position to allow placement in the tissue to be sutured, they press the same button a second time and the needle does a full rotation. If there is a problem or the user decides the needle is in the wrong position there is a backwards option. This simple process allows for the emulation of most hand suturing techniques and knot methods currently in use by doctors and surgeons. In contrast, other products on the market either rotate a needle using a custom notched needle, which limits use, or they pass a short straight needle from one jaw to another. Our device is designed so it is intuitive to use for a surgeon and can perform standard proven techniques while being needle safe. F: How has the Formlabs 3D printer changed your design process? AB: Before we got our Formlabs 3D printer, we used to outsource our parts which would take 1-2 weeks to get back, so each part was very much over-designed due to both the time and cost constraints. Unfortunately we also found that during the time our parts were en route we often had upgrades that made those parts obsolete, which was frustrating. With the Formlabs 3D printer we changed the design method quite drastically, it meant we could make small changes, print a part within a few hours and repeat the process several times in one day; for our endoscopic version we had the initial design complete within 2 weeks and estimate a time saving of at least 6 months. Using your own printer means that if we need to change or replace a component it is a very fast process and in some cases we are able to print several spares, just in case (we invariably break something during testing!). We have been using another company to produce prototypes on a Connex 500 and the Formlabs printer is producing similar quality accurate parts. We had looked at many different types of 3D printing and apart from the metal SLA printers, which are hugely expensive, there is not currently a better technique for producing small highly detailed parts. The Formlabs printer is a truly exceptional product, allowing start-up companies easy access to prototyping that was impossible just a few years ago. We are impressed! Download a case study to learn more about how medical device engineers use the Form 2 to accelerate product development by iterating complex designs in days instead of weeks, at a fraction of the cost of outsourcing or silicone molding. F: What does the process of designing a part for a medical device involve? Is there a reason your prints involve multiple parts that are then assembled together? AB: I work with Autocad for the initial design then export as an STL directly to the Preform software. Once we have established a design that can power a needle consistently and with enough force, we have a load rig that we put the device into which measures the maximum force available at the tip of the needle, and we compare that to what has been established as the forces necessary for that needle type. Designing the different versions of the device in parts was mainly to allow us to swap key components more easily during the prototyping and testing stages, in particular the internal components that drive the needle. At the same time we made sure that certain parts, like the interface with our handle were standard and could be interchanged between the different design iterations. We also had to consider the end user during the design process, and Sutrue has been very fortunate for several years to have a world class cardiac surgeon at the Royal Brompton Hospital in London, Mr. Richard Trimlett, helping us with the design both practically and ergonomically and with testing the different versions of the device on varying materials and tissues. F: What should we expect to see next from Sutrue, and from 3D printers in the medical world as a whole? AB: We are currently proving the designs for the endoscopic device. Once completed we want to make printed devices for 10-15 surgeons, so they can physically trial the product. This is the huge advantage of 3D printing as we can just print additional devices when needed. In the medical field, we have seen research 3D printers using cells to create parts of animals and cold metal 3D printing where the metal is created by chemical reaction. Some of the Realizer, eos and Renishaw machines are already producing custom teeth and custom implants for surgery. If the whole process could speed up, there would be no reason why surgical parts and custom made medical instruments could not be produced for each individual patient during the actual surgery. We also have an idea to take a MRI/CT scan of a heart and print a custom part to hold the heart securely for surgery. At the moment there are a few regulatory hurdles to overcome, such as being allowed to use the 3D printed parts without further approval, but I can definitely see a use for 3D printers in the operating room. Thanks, Alex, for sharing Sutrue’s story! To see examples of Sutrue’s devices in action be sure to check out their site or to take a look at more photos of their products. 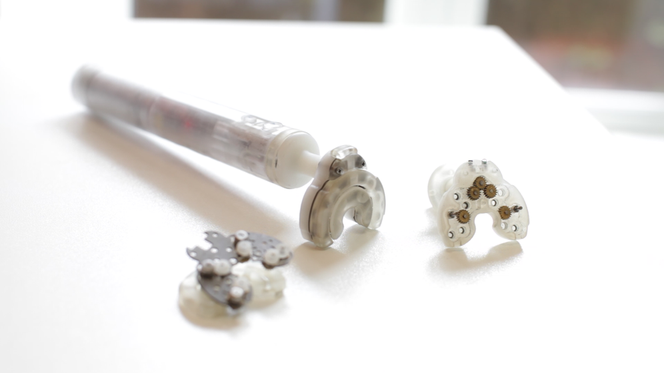 Learn more about how Formlabs 3D printers are used in healthcare.